Cody and I set out to try a new White Bass fishing area, but before we had even driven three miles, we came upon a raptor which we had never seen prior to this weekend. Cody saw the bird of prey on Friday, and then, it was eating a fresh, roadkill opossum in the middle of the road, today. We reached our fishing hole, readied our kayaks, and set out. We received reports that White Bass were running about five miles upstream of our spot and about five miles below us. We fished near the river's mouth right down the middle. The wind was a battle at places, but keeping to the middle eased some of the challenege and pushed us back upstream with little paddling on our part. Our strategy played off. While our numbers were not high, Cody landed very fat, egg-filled girls, with the largest weighing exactly 2 pounds! Even the buzzards awaited the White Bass by the dozens in the trees lining the river banks. The water temperatures hovered around 49°F, so our understanding of the White Bass run seems to be holding true. Cody and I have always heard that the males make their run first awaiting the females. The hefty females run when the waters are warmer. We think because they don't move off their nests and need the water temperatures to be warmer, so they can stay warm. Either way, it will be interesting testing our theory out over the next several weeks. Our friends and husband-wife anthropologists, Linn & Dr. Jack Keller, and outdoor sportswriter Robert Sloan, all Coastal and South Texas residents, told us the bird in the first picture was a Caracara, a Mexican Eagle. In 25 years, I have never seen one this far north, specifically, N32 27.392 W96 40.595. Glad to see you found some White Bass. It's always nice when a plan comes to fruition. 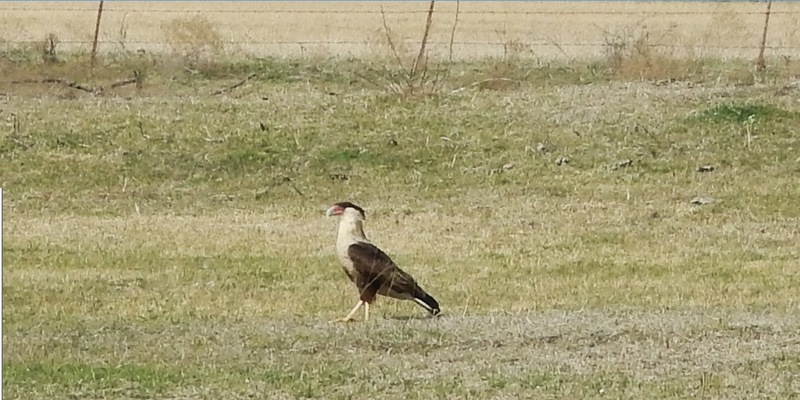 The bird is indeed a Crested Caracara (Caracara cheriway). I've never heard of them being called a "Mexican Eagle," but that may be a local name in your neck of the woods. It is a relative of true falcons but pretty far away from eagles on the family tree of birds. I actually work with raptors everyday! I am the Director of Education & Outreach for a wildlife center and use raptors for educational programs. We have five at the center: an American Kestrel (North America's smallest falcon), a Merlin (another small falcon), a Barred Owl, a Mississippi Kite, and a Red-tailed Hawk. In case you ever need any more raptors, other birds, or reptiles identified... I always enjoy the ID game. Also, I replied to your last comment on my blog... and I was hoping you'd see my reply. White Bass are a blast when you get into them. For us thats a month a way still but I cannot wait! Great job and can't wait to see more pictures.